“Mississippi‘s Enchanted Little Castle” and “Cozy House for you & your family”. The total amount of our guest for these two houses can be 10 people. The interior of “Mississippi’s Enchanted Little Castle” was recently remodeled by a designer, who provided modern and charming European accents while preserving an American-style interior. Outside, the unique landscaping uses local Missouri stones and wood. We hope our guests will be able to enjoy and appreciate this European charm! Safe and convenient street-parking on the front and left sides of first unit’s house we have free fenced-in parking in our backyard . Additional 2 twin sofas bed in convenient areas. 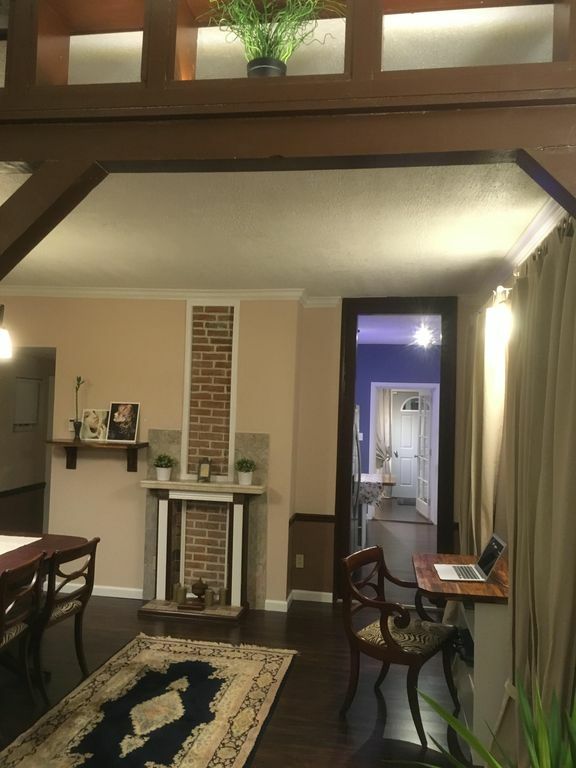 This House is located in an historical and beautiful area: just 3 minutes’ drive from the Mississippi river, with remarkable green way in the Historical Jefferson Barracks Park, and 15 minutes to Downtown Saint Louis. This house is located adjacent to our corner house. You will find safe and convenient street-parking on the front and left sides of first unit’s house (space enough for more than 5 cars)! If you would need, we have free fenced-in parking in our backyard (space enough for 3 cars). •	The modern kitchen has a coffee maker, toaster, side-by-side refrigerator, range, microwave, all necessary cooking and dining equipment; dishwasher and in-sink disposal. •	New Smart TV/“ROKU” - streaming service is included. You will find the “ROKU” remote in the living room. •Welcome to use our nice patio with chairs surrounding the special landscaping, you will enjoy it. •New Washer/Dryer (please notify Natalia if you intend to use). Laundry is available but we don't provide detergent or softener sheets. •	The upstairs bathroom made in a fashion-style: shower cabin joins the bathroom. If you would like to have more privacy for your shower, you can use a special screen. In addition, we provide two sofa-beds (twin size). Next by both sofa-beds are basket boxes where you will easily find bedding for the sofas. One sofa is locating in the “sun room” and the other on second level family room. Both rooms organized very carefully for our guest to feel comfortable. •	The house has a few closets and shelves you can use to put your own goods. •	Towels and all bed linens are provided. •	There's an iron and ironing board, hairdryer and hangers in the closet. We try very hard to think about our guest’s needs. You will enjoy our beds and after long busy days you will be able to sleep comfortably in our cozy bedrooms. This house is approximately 3 minutes to I-55; 20 min. to FOX Theater, St. Louis University; 10-15 min. to Bush Stadium; 10 -15 min. to St. Louis Gateway Arch, Forest Park, Botanical Garden and Downtown of St. Louis; Historical Soulard, or Lafayette Square; 5 miles from a Metro station; 10-15 min. to Edward Jones Dome; 10-15 min. to West County and South County Malls; 3.5 miles to Millennium Convention Center; 15-20 min. to West County (CLAYTON); and a bus station within 5 min. walking distance; 3 minutes from City-River Casino ; 3 minutes from Jefferson Barracks Park and Lemay Aqua Center’; 5-10 minutes to YMCA and Carondelet Park; 25 minutes from Six Flag- Recreations Center; 10 minutes to South County Mall, 15 minutes West county Mall. We would like to recommend renting a car to explore as much as you can-☺.You can rent a car at the airport or at Enterprise rent a Car, which is down the street from the our house and they will come pick you up from our vacation home at no charge. •	•River City Casino in 3 minutes /On the banks of the Mississippi, this sprawling luxury resort and River City Casino is 9.0 miles from downtown St Louis. (There are multiple dining options including a steakhouse, a burger joint, a buffet and a pub. •	The Pavilion at Lemay a new Recreation Center just less than 5 min. from our house , it is on the beautiful Jefferson Barracks Park Including : Aquatic Center! •	Traveling time between the house and all main tourist attractions is approximately 5 - 20 minutes. •	Laundry is available by request! We do not provide detergent or fabric softener! •	The oven is available for your use, but our guests are responsible for cleaning-up after themselves! •	Towels for use are one set of towels per person. •	In upstairs’ bedrooms we offer new beds with new and very comfortable mattresses. •	Two twin sized sofas -- located in private and convenient areas – include their own bedding. Please, use mattress’s covers. •	We try very hard to think about our guest’s needs. You will enjoy our beds and after long busy days you will be able to rest comfortably in our cozy bedrooms and sleeping areas. III Please use the Trash container next to the little fence by the street. It is the single receptacle . If you staying for long term , please asking Natalia for additional Cleaning service! .“No Pets”, But by special request we would allow you to stay with your pet/limited to a maximum weight of 20 lb. Kennel is necessary . .This is a NON-SMOKING PROPERTY. We own this house. Welcome to our home and welcome to contact us any time. Clean,comfortable ,safe and easy access to all attractions in St. Louis. We remodeled this house and worked very hard to make this home very comfortable.All are new Interior. The house has a weird layout but still a nice place to stay. The owners couldn't get the air to work while we're there but did refund US money to make up for a sleeping when the air went out during our trip. Would recommend staying there if you don't mind weird layout of the bedrooms. The batteries of the air conditioner's panel were changed in the during this guests staying and conditioner started working perfect as usually. Thank you, Darrin,for help us with this. Generally it felt clean and safe, but is probably most suitable for a family with young children. We were 4 professional business women in St Louis for a trade show, and were drawn to the property because of the numbers of bedrooms. However the layout is awkward, with one bedroom also containing the shower that the 3 upstairs bedrooms share. The downstairs bedroom is really a sunroom, and you have to walk through it to get outside. The kitchen is equipped with a bare minimum of basics, salt and pepper, coffee filters, but expect to have to do major shopping if you plan to eat here. Beds and bedding were adequate, but not terribly comfortable. This home has been beautifully remodeled with pretty much all of the space in the home made useable. The available sleeping spaces are good for six easily, eight if there are children in the group. (Two of the beds are futons, so co-sleeping is necessary for eight, or small ones could sleep in the sofas.) We would have used a few more blankets, but we are cuddles and it was cold during our stay. The kitchen remodel is lovely, and there is plenty of space at the table in the dining room. The seating space in the living area is limited, but bringing in dining chairs or kids hanging out on the floor takes care of that. The second shower is in an open area upstairs and is a unique, quirky feature. Modestly might be an issue, but Natalia has a screen that can be placed around it for privacy. The full bath downstairs is small but excellent. If the weather is nice, there is a very nice, large garden area behind the house. I will say that parking an RV back there would require some expert skills. Overall, this is a lovely home. Kristin and her group were very-satisfactory guests. They were very responsible, treated the property as if it was their own and communicated with us if they had any questions or comments. Kristin here followed recommendations about using appliances and left the premises very clean. Newly remodeled, comfortable, clean, very nice. This home was very nice, great amenities, clean, newly remodeled. Our family enjoyed the roku and free wifi as well as the gourmet kitchen. Beds were very comfortable, plenty of pillows and blankets. The house was very clean. The kitchen well stocked. We felt very safe in the neighborhood. The manager, Larry, was helpful and truly very nice.